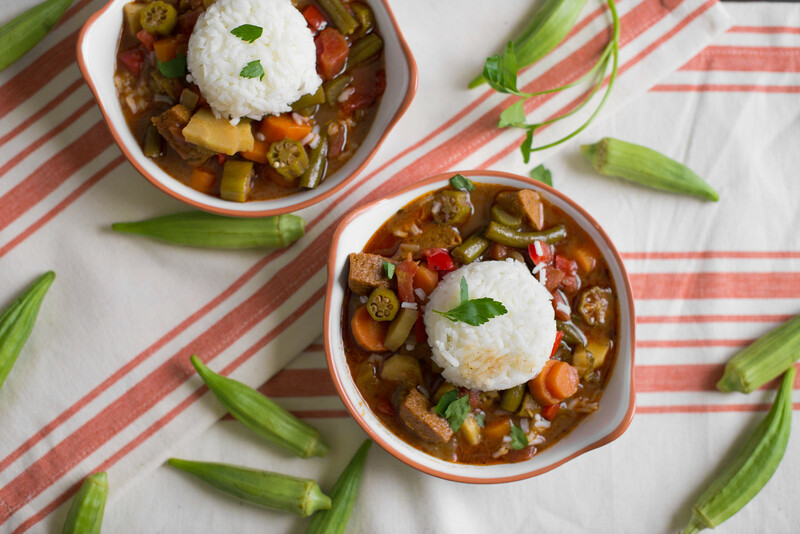 This a great summer gumbo recipe which could easily be adapted for meat lovers. I tweaked a recipe I found in a great magazine called “Farmers’ Market Cookbook”, which uses a lot of great summer Farmers ingredients. I also added some protein in the form of tempeh (fermented soy), but some spicy vegetarian sausage would be even better. For those with allergies or sensitivities, check labels for ingredients to tempeh and sausage carefully. Many of the vegetarian sausages for example have soy and/or wheat. I have written this it as very mildly spiced gumbo, for little tasters. It can definitely be “kicked up” for spicy food lovers. Serve this over some white or brown rice and it’s a complete meal. In a large heavy pot combine 1/2 cup oil and flour over high heat, stirring continuously until it becomes a dark caramel color, about 10 minutes. Add onion, celery and pepper and cook until soft, about 5 minutes. Add 4 cups water, tomatoes, green beans, carrots, parsnip, okra, and spices. Season with salt and pepper. Reduce heat and cook for 40 minutes. Brown tempeh or vegetarian sausage in 2 tablespoons oil over medium heat for 3-5 minutes. Add to gumbo for last 5-10 minutes of cooking. Serve over rice. 6 (make 1.5 x 2 times the recipe for a great "Cook Once, Eat Twice Meal"